One of the great American past times and excuses to get together for a few adult beverages is smoking meat. It is the definition of relaxing and taking it easy, especially on a warm summer day (or frigid winter afternoon as I have done in the past, but hey – I don’t discriminate against Mother Nature my friends) where you can kick back and have a few cold ones to make the time pass. 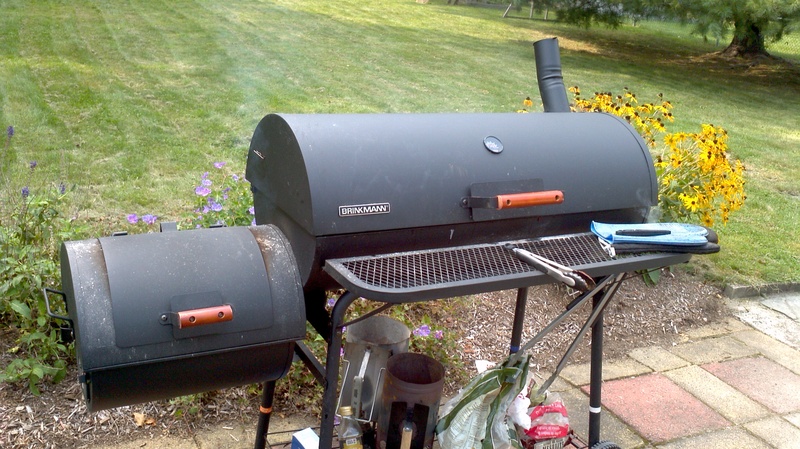 It also allows people like myself to use my smoker-box (which is attached to my charcoal grill) and take advantage of an American tradition of slow cooking that few other countries celebrate like we do here in the great U-S-of-A! But there are other traditions to consider, such as males occasionally wearing USA lettered thongs in the work place (not something I would do or suggest – but I’m just sayin’!). The Beast is fired up and smoking ribs, just how we like it! When it comes to pork ribs or smoking of any kind, I’ll be the first to tell you that I’m no expert, but I am an enthusiast who loves to try and smoke just about anything (on the grill that is people!!! I’m a parent now). Whether it be pork loin, pork roast, whole chickens, beef ribs, etc… I’ll give it a shot, but my favorite without a doubt is pork spare ribs. I like to let them smoke for about 5-6 hours using hickory and apple wood and just easin’ back on a lazy Sunday afternoon. I keep trying until I get it right, or until it tastes good enough that I can’t wait to do it again! When preparing your ribs make sure to wash them thoroughly and remove the membrane from underneath the bones across the rack (I would show you a photo of that but I’m trying to encourage hunger, not nausea). Once the ribs are ready, I prepare my rub of paprika, cayenne, garlic powder, onion powder, oregano, espresso, salt, black pepper, and dried thyme (you can buy a dry rub if you like but make sure it’s specific for pork). Mix all the ingredients together and then spread it generously on both sides of the ribs and rubbing into the pork. I always do this the night before to allow the rub to really sink into the meat. To start the smoker, I use 2 chimney starters of hardwood lump charcoal and once the wood charcoal is grey, dump them into the smoker-box and add a few wood chunks and chips that have soaked over night (you might need to add more wood charcoal as the cooking progresses and you don’t want to put too many wood chunks and chips in the beginning because too much smoke will dry out the ribs quickly). Now, finally – it’s time to put the ribs on the grill! I put the ribs bone side down with a pan of water underneath the grates. Under the water, I’ve placed bricks in the grill pit, wrapped in foil to help absorb heat in the grill, while the water provides moisture for the ribs. Maintain a temperature of 225 to 250 degrees and for the first few hours, it’s a good idea to refrain from opening your smoker-box or grill and letting the heat/smoke exit. To preserve the tenderness of the ribs, it’s important to add a “mop” to the ribs (dressing) so I like to add honey bbq sauce into a small foil pan and place on the grill. Every 30 minutes after the 3rd hour of smoking, I lather the ribs with the honey bbq sauce alternating sides (close to the 5th hour of smoking, you can also throw some corn wrapped in aluminum foil into the smoker-box for about 30 minutes – the corn comes out very succulent this way and my 2-year old loves it). Most experts, depending on the style of ribs will use an apple cider and vinegar mop during the smoking process but I like to off-set my spicy rub with a bbq sauce flavor. After about 5-6 hours, check the ribs to make sure they’re tender and use a meat thermometer to check the pork’s temperature. If the temp says 165 degrees, then you know it’s time to eat! To go with this I’ve made Focaccia style garlic bread with fresh rosemary, basil, garlic cloves, olive oil, Reggiano Parmigiano and Pecorino Romano over fresh Ciabatta bread (you can use a French baguette as well). Normally I might prepare some margarita’s for smoked pork ribs but there’s no replacing an ice cold beer on a hot day so crack open a Corona to go with those bad boys because you’ve earned it! Clean pork spare ribs by removing membrane and washing under sink. Mix all rub ingredients together within bowl (paprika, cayenne, salt, black pepper, garlic powder, onion powder, dried thyme, espresso, and brown sugar) and generously pour and rub into ribs on both sides. Cover ribs in wrap and place in refrigerator overnight. Soak hickory and apple wood chunks overnight, then drain before use. Prepare smoker/grill with 2 chimney starters full of hardwood lump charcoal and when turned grey, place in smoker-box with some wood chunks. As ribs smoke, continue to add more wood chunks periodically. Lay pork ribs onto grill bone side down, and close grill and smoker-box for several hours maintaining a temperature of 225 to 250 degrees. After 3 hours, dress pork ribs with honey bbq sauce, alternating sides every 30 minutes. After 5-6 hours, when ribs are tender and at or near 165 degrees, take off grill and let sit for 5 minutes before cutting into strips. Take remaining bbq sauce from pan and dress over ribs. 4 out of 5 stars based on 20 ratings. Simple focaccia style garlic bread with fresh ingredients. Slice ciabatta bread length wise and then cut into 4 large pieces. Lightly add olive oil to all 4 pieces. Chop garlic cloves, fresh basil and rosemary into very fine pieces. 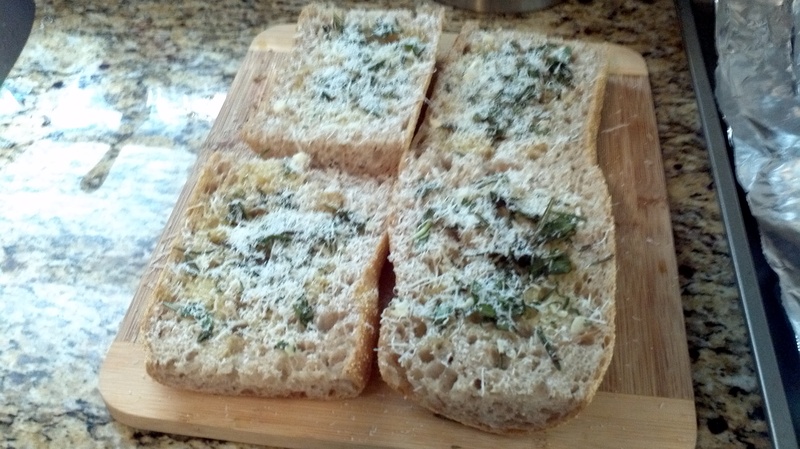 Spread garlic, basil, and rosemary across 4 ciabatta bread and season with salt and pepper. Grate Reggiano Parmigiano and Pecorino Romano over bread. Put over charcoal grill (low heat) for 5-7 minutes or place in bake at 400 degrees for 5 minutes. Cut into thin strips and serve. Click here for full Smoked BBQ Pork Ribs Recipe or the Focaccia Garlic Bread Recipe, and all other Paggi Pazzo recipes. Perhaps the easiest pasta recipe will you ever make, Pasta Aglio e Olio is so simple and basic it will take you no time to prepare and leave you quite satisfied! Even Ron Burgandy and Brian Fantana agree, “60% of the time it works every time!“! I have been enjoying this dish for as far back as I can remember and it is a very common traditional Italian recipe from North to South with a few different ingredients added or removed throughout the regions but many consider this to be a Roman creation (what didn’t they create?). Some prefer to add peperoncino (and by that I mean the dry Italian pepper, not the banana bell-pepper, which I do enjoy from time to time by the way….) but the Roman way (how my mother made it) and how I grew up knowing it – which was straight to the point without any distractions and included these simple items; spaghetti (or linguine), garlic, salt, black pepper, olive oil, grated cheese – and that’s it. Oh and by the way, it tastes great! Along with this pasta I’m preparing some Rosemary Pork Chops with Spinach but you can certainly make the Pasta Aglio e Olio by itself as your meal. I prefer to accompany a basic spaghetti dish like this with some protein, but that’s just me and we don’t judge here at Paggi Pazzo. Drain pasta through strainer and add garlic oil in pan, remaining 1/4 cup of olive oil, handful of Reggiano Parmigiano or Pecorino Romano, and fresh parsely to pot with pasta and stir firmly for several minutes. Add to pasta bowl or plate and go to town! Chop garlic clove and rosemary very finely. Lightly season pork on both sides with salt and pepper and at high heat, place pork on pan for 2-3 minutes on each side until seared. Once seared, drain excess fat and add chopped garlic clove, salt, pepper, rosemary, splash of white wine, teaspoon of olive oil, 1/2 lemon squeezed (no seeds), and spinach to pan and cover. Place in oven and let cook for 15 minutes, then remove from oven and allow to cool done for several minutes. Place pork and spinach on plate and feast! 5 out of 5 stars based on 19 ratings. Click here for full Linguine Aglio e Olio Recipe or the Pan Seared Pork Chops with Rosemary Recipe, and all other Paggi Pazzo recipes. When I need to make a quick pasta and I’ve got some left over ground beef, because….well who doesn’t have left over ground beef? I like to throw together, what I’ve self-proclaimed Pasta Primavera con Polpette, which can sometimes be whatever vegetables I have left in the fridge with whatever short pasta is in my pantry. By no means is this a “specialty dish” but it’s easy to throw together (perhaps not as easy as Pasta Aglio e Olio) and it’s a hardy pasta with healthy ingredients that your family will enjoy. As always, I’m going to suggest vino with this (shocker!!!) and any red table wine is a nice compliment to this dish, such as Montepulciano d’Abruzzo (that’s a shout-out to all of my Abruzzi amici…hip-hop Ah-bruzz-ohhh, hey, ho…. that’s how they roll down there). So here it is from Paggi Pazzo – Buon Appetito! Chop 1 clove of garlic, 2 basil leaves, 1/4 of onion for polpette. Prepare polpette in a bowl by mixing ground beef with chopped garlic, onion, basil and add pinch of salt and pepper, teaspoon of milk and breadcrumbs (when I have the time I make my own but you can use pre-made) and mix together with hands. Create little “meat balls” but press down to create more oval shape and place on cooking tray and into pre-heated oven for 30 minutes at 400 degrees. Chop remaining garlic, basil, and onion while slicing cherry tomatoes in halves and zucchini into thin slices. Begin to make primavera sauce in a large pan with olive oil, remaining chopped garlic and onion. Prepare pasta pot and add pinch of salt to water. Once garlic and onions begin to melt into the oil, add crushed tomatoes, cherry tomatoes, bay leaves and chopped basil, salt and pepper, and cook sauce at a low heat. After 15 minutes, add cooked polpette into the sauce and stir gently. When pot of water is boiling and cellentani (you can also use a variety of short pasta if you’d prefer). After 4 minutes of boiling water, add zucchini to pot of pasta and stir. Continue to stir until 10-11 minutes when pasta is “al dente”. Strain pot of pasta and zucchini and move to sauce. Stir all ingredients together and add grate Reggiano Parmigiano generously over pasta. Place into pasta bowl and devour! When it comes to preparing sauces or dressings, I really enjoy making chimichurri for my Argentinian style steak on the grill. The beautiful country of Argentina is one of my favorite cultures when it comes to food and wine and “los albicelestes” (which have eerily similar soccer colors to my favorite Calcio Italiano Team, LAZIO!!!) know a few things about chimichurri, beef, and wine. The cuisine in Argentina is influenced by many European cultures, such as the Italians, French, Spanish, etc… and while all of those contributions have brought a unique taste to their dishes, there are few countries that can hold a candle to Argentina when it comes to grilling, or as they like to call it, “Asado“! One of my favorite restaurants to find great Argentinian food, Tango, offers great empanadas, fantastic steak that is cooked on a grill brought from Argentina (impressive! ), and great Malbec’s and Mendoza’s to join them. But what really stood out for me, and what Argentinians cannot do without – was the chimchurri on every table that I continuously smothered on every piece of bread, steak, and if there was any left for dessert I would’ve done smothered that too….or…maybe not. Chimichurri is an Argentinian dressing that is often dressed on meat (more often used while the meat cooks or after is cooked). I however love to use it as a marinade not only on beef but also chicken and pork, and….well, just about anything. Below I’m sharing with you my chimichurri recipe that I have prepared over a dozen times, tweaking ingredients, changing amounts, etc… and it wasn’t until maybe the 5th time that I felt I finally had it right! One of the most important items to go along with the chimichurri is the beef! Make sure you have a fine piece of steak as the quality of meat is extremely important (I’m very fortunate that my mother-in-law buys me quality Kinnealey Steaks I can grill all summer long), so if you have the time seek out a butcher who will offer you better quality cuts. One Argentine friend suggests short beef ribs as his choice of meat – hard to argue with that! It’s also important to make the chimichurri ahead of time and allow it to marinate in the fridge for at least a day before using. I’ve tried it in less time before and it loses something so don’t make the same mistake I did the first time. Also, use lump-charcoal wood if you’re cooking on a charcoal grill and use very few wood hickory chips for a slight and additional smoky flavor. I’d also suggest getting yourself a nice glass of Malbec as it really assists the beef and chimichurri. If you have a Cabernet Sauvignon around that will be a nice compliment too but I’d strongly suggest the Malbec. While you’re at it, if you have an Argentinian soccer shirt with the #10 Maradonna or Messi on the back, throw it on and feel that South American ambiance all around your grill….or maybe you’re just seeing me trying to steal the food off your grill? Either way, you’ll (we’ll) have a great time, Vamos La Albiceleste!!! Add into a bowl or jar, all of the chopped ingredients (parsley, garlic, scallions, shallot, yellow pepper, and oregano) with the salt, olive oil, white wine vinegar, hot water, paprika, cumin, and crushed red peppers. After steak is seared and medium well (or dependent on how you like it), turn steak over again and move to lighter heat or safe zone and add another dressing/brush of chimichurri to the other side of the steak. 5 out of 5 stars based on 25 ratings. Click here for full Argentinian Chimichurri Steak Recipe and Chimichurri Recipe or all other Paggi Pazzo recipes. La Pizza Margherita Recipe, the classic “Napoletana” dish! La Pizza Margherita is the classic and quintessential dish of Napoli, Italia and as the locals will tell you there, no one in the world makes better pizza (although my Roman family would beg to differ and likely find a way to get some pancetta on there too). What is so fantastic about this pizza is how simple and basic it is but at the same time how delicious the few ingredients blend together. Less is more and in this case, rather than stuff your pizza with a 1,000 toppings and dilute the taste of each, the few included burst with flavor! 5 out of 5 stars based on 27 ratings. Click here for full Neapolitan Pizza Margherita Recipe and all other Paggi Pazzo recipes. One of my favorite things in the summer time to cook on the grill is paella. This Spanish dish is a classic from southern Spain that has been repeated, imitated, and replicated a million times over, everywhere in the world. What I love about grilling paella is the benefit of cooking it over a wood-fire charcoal grill. The smell that illuminates from the wood really accentuates the meats, fish, and dish itself. One of the things though I would recommend before trying this at home is to get a large paella pan or iron skillet because the heat from the wood fire could damage your nice kitchen pots and pans and we don’t want that to happen. Along with the paella, it is essential to have a nice jug of Sangria to accompany it. The Spanish had it right when it came to good eats and drinks and one day I plan on traveling over to the Iberian nation to get the real stuff. But for now, I’ll just keep trying to emulate our Spanish brothers/sisters. Below is my recipe for grilled paella, how to prepare it, and what ingredients you will need. ENJOY and Salud! Grilling paella over a wood fire on a charcoal grill. 5 out of 5 stars based on 81 ratings. Viva España! - Mas sangria! 1. Chop all fruits into small pieces and add to pitcher. 2. Add sugar, brandy, orange juice, and wine. Stir for several minutes. 3. For best results, allow wine, fruit, brandy, and sugar to sit and marinate in refrigerator overnight. However, if time is not available, add lemon soda/ginger ale to pitcher and enjoy! Click here for full Grilled Paella Recipe or Spanish Sangria Recipe, and all other Paggi Pazzo recipes.